TD examines ConsumerLab.com's analysis of the best omega-3 supplements on the market. Omega-3 fatty acids DHA and EPA have been studied extensively, and several clinical studies suggest that taking an omega-3 supplement could offer a wide range of benefits for everything from mental health and inflammatory disease to memory and dry eyes. 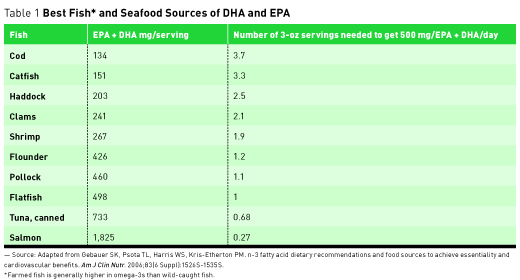 While the amounts of DHA and EPA in fish and seafood are well known (see Table 1), it's harder to know what and how much you're getting in supplements, whether from fish oil, krill, or algae. (Krill are small shrimplike crustaceans that are the main food source of some fish, whales, and even birds.) Krill oil supplements are considerably more expensive than fish oil supplements. They also contain the antioxidant carotenoid astaxanthin, which is found not only in krill but also in microalgae. Research suggests that astaxanthin may reduce oxidative stress, block DNA damage, and lower C-reactive protein and other inflammation markers.2 The majority of omega-3 supplements come from either fish or krill oil, but some provide omega-3s (mainly as DHA) from algae, an option for vegetarians. Now, algae-based supplements are available that provide both EPA and DHA. Fish oil in softgels typically is the least expensive source of good-quality DHA and EPA. Neither the FDA nor any other federal or state agency is required to routinely test fish or marine oil supplements for quality before marketing and selling, so there are no independent quality control mechanisms in place to ensure supplements are safe and the labels are accurate. That's where ConsumerLab.com, a privately held company that independently evaluates health and nutrition products, comes in. ConsumerLab.com purchased, tested, and compared 29 popular brands of omega-3 supplements.3 The results were then confirmed by an independent laboratory. Of the brands tested, only three didn't contain the amount of DHA and/or EPA or other listed ingredients, such as phospholipids or astaxanthin labeled on krill oil supplements. According to Tod Cooperman, MD, president of ConsumerLab.com, "Nearly all of the fish oil supplements contained what they claimed—at least among the most popular brands." He also stated that he believed the findings reflect the current market. There's no official US recommendation for the intake of omega-3s, DHA, or EPA. Research has been inconclusive regarding their benefits for preventing or treating specific conditions. However, there's a difference between getting enough omega-3s to prevent a deficiency and getting enough to avoid or treat disease. Some organizations, including the American Heart Association (AHA), the Institute of Medicine, and the World Health Organization, as well as organizations from other countries, have recommended anywhere from 200 mg to 1,200 mg per day of a combination of the two fatty acids for general health, as well as disease prevention and treatment.4 The 2015–2020 Dietary Guidelines for Americans recommend eating two servings of seafood per week, which provides an average of 250 mg of omega-3s per week, for reduced risk of cardiovascular disease and obesity. The AHA recommendation for people with documented coronary heart disease is to consume 1 g/day of DHA + EPA, preferably from oily fish.5 Amounts up to 4 g/day are recommended for those with elevated triglycerides. Lower amounts in the range likely are adequate to prevent a deficiency; greater amounts may be necessary to prevent or treat disease. The recommendations set by several other countries focus on nutrient adequacy and preventing an essential fatty acid deficiency, not on disease prevention. Recommendations for specific conditions, such as schizophrenia, lupus, or depression, though not proven to be effective, range from 6 to 12 g (not mg) per day, which may not be safe. Because omega-3s are known to thin the blood, large doses of DHA and EPA could cause excessive bleeding, especially if taken in conjunction with prescription blood thinners, such as warfarin. Although omega-3 supplements generally are considered safe, the AHA recommends doses greater than 3 g per day be taken only under a doctor's supervision. In its review of the literature, ConsumerLab.com concluded that despite the promise of fish oil as a preventer of heart disease, research doesn't support fish oil supplementation for preventing heart attacks or stroke in people who have heart disease or who are at risk of heart disease. While some research has found that fish oil supplements can lower triglycerides and reduce the risk of blood clots, the proven cardiovascular benefits from fish oil are strongest with the consumption of fatty fish. The AHA recommends two or more servings of fatty fish per week. "Among people who don't regularly eat fish, the supplements seem to help some with regard to arthritis, dry eye, colon and breast cancer, depression, and possibly cognitive decline," Cooperman says. Taking omega-3 supplements with a meal, preferably one that contains other fats, may improve absorption. 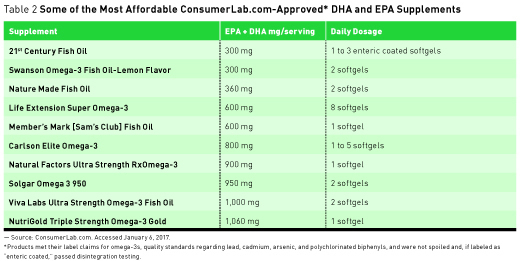 Pricing varies greatly; in ConsumerLab.com's analysis, omega-3 supplements ranged from $0.02/100 mg to $0.22/100 mg. Omega-3 supplements from krill oil ranged from $0.25/100 mg to $0.61/100 mg.
Lastly, it's important for dietitians to let clients and patients who don't like fish know that labeling claims such as "Pharmaceutical grade," "tested in FDA-approved laboratories," or that say the supplement "provides a % DV for EPA and DHA" are bogus. The FDA hasn't defined the term "pharmaceutical grade"; it doesn't approve laboratories for analyzing of supplements, and no % DV has been set for omega-3s. 1. Singh M. Essential fatty acids, DHA and human brain. Indian J Pediatr. 2005;72(3):239-242. 2. Kidd P. Astaxanthin, cell membrane nutrient with diverse clinical benefits and anti-aging potential. Altern Med Rev. 2011;16(4):355-364. 3. Product review: Fish Oil and Omega-3 and -7 Fatty Acid Supplements Review (Including Krill, Algae, Calamari, Green-lipped Mussel Oil, and Sea Buckthorn). ConsumerLab.com website. https://www.consumerlab.com/reviews/fish_oil_supplements_review/omega3/. Updated January 31, 2017. 4. Gebauer SK, Psota TL, Harris WS, Kris-Etherton PM. n-3 fatty acid dietary recommendations and food sources to achieve essentiality and cardiovascular benefits. Am J Clin Nutr. 2006;83(6 Suppl):1526S-1535S. 5. Essential fatty acids. Linus Pauling Institute Micronutrient Information Center website. 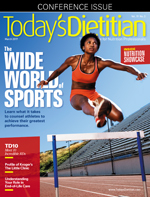 http://lpi.oregonstate.edu/mic/other-nutrients/essential-fatty-acids#metabolism-bioavailability. Updated April 2014. Accessed January 10, 2017.